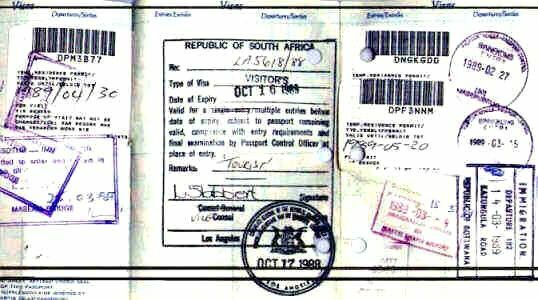 From February through April in 1989, the ethnic and political climate was ideal to make my two months on safaris and car rental drive throughout all the nations in southern Africa. The report here is split into the following sections. 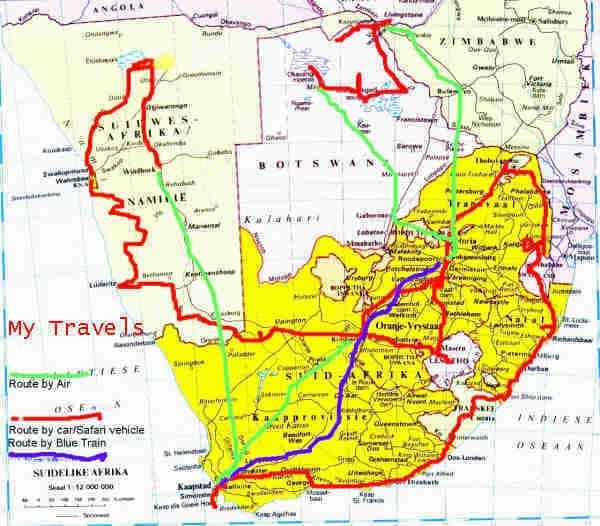 You can go to each section by clicking on the Section #, or you can wait until you get to the bottom after the map of southern Africa marked with my travels, and click on the start button, and progress from section to section. I had a supplemental page in my passport that became completely full with some overlapping during this two months. To see an enlarged version, click on the photo. Use your return button to return to this page. This map of southern Africa is marked to show my various travels by air, safari and by rental car. The descriptions follow. I spent the first week with an Avis Volkswagen Golf rental car driving from Johannesburg south through Soweto to Lesotho, back through Bophuthatswana to Bloemfontein and on to Kimberley, then back to Johannesburg. In addition to the normal sightseeing, I went on a one day mini-safari in the Thaba Nchu Game Reserve. I was also escorted around the Kimberley mine and the recovery tailings from the 1800 digs by a mining engineer of the firm. He even took me through a "drive-in" bar for a happy hour drink. Drive in? Next came the two week Karibu Safari. It started with a flight from Johannesburg to Maun in Botswana. Then by this huge vehicle and small dugouts to Okavango Delta, Savuti, Chobe National Park, and other game viewing spots throughout Botswana and Zimbabwe. Included were a short flight over the Okavango, a couple hours of cruising on the Zambesi River, fly over and walk around the Victoria Falls, etc., etc. There were just four of us with a guide and driver. We had this super huge vehicle that could and did go where jeeps would never make it. We saw hundreds of elephants, wildebeests, giraffe, hippopotamus, warthogs, zebras all over the place, ostriches, buzzards, and thousands of all species of antelopes (Springboks, Steenbok, Impala, Roan Antelope, Sable Antelope, Gemsbok, Buffalo, Kudu, Bushbuck, Eland, Reedbuck, and the Duiker.). Yup, we caught up with and followed a pride of 3 males and 5 females lions as they meandered and laid down every so often over a 3 mile trek. We did spot and spend a short while looking at a leopard lazily taking it easy in a large tree. One of the sorrowful sights was a dead elephant that we came across that had obviously been killed by poachers, since the tusks were gone. We made up our small tents each night and slept inside with our sleeping bags. The weather was perfect, with clear skies and temperatures around the 80's all the time. This was perhaps the most fabulous single adventure of my life. In my Avis Volkwagen Golf, I left Johannesburg went to Pretoria then to Cullinan where I visited the Premiere Mine and museum. Then on to Venda. From there I drove over and south along the almost entire length of the Krueger National Park There were lions, elephants, giraffes, etc. right along and on the roadway. My car never seemed to startle them. Guess they are used to nuts driving along. I traveled through Swaziland and into Natal where I drove around the Hluhluwe Game Reserve. It was there that in addition to the other species of animals, I saw several both White (square-lipped) and Black (hook-lipped) Rhinoceros. At one point I got out of the car to take photo and one started to charge the car. But, I got in and drove away. At Durban, I was able to take a swim in the "Whites Only" beach on the Indian Ocean. The weather, temperature and humidity reminded me of Florida. From here I drove through Transkei, Ciskei and along the southern coast to Cape Town. Along the way, I rode an ostrich, stood on an ostrich egg, ate ostrich and crocodile meat, crawled through small openings in the Kongo Caves, and visited lots of museums, small game reserves, and crocodile farms. And of course had my share of good wines at the many wineries. At Cape Town, I took the cable car up to the top of Table Mountain, drove to the tip of Cape Point, and walked all over the main part of town. (Later, after my next safari, I had a personalized tour of the Houses of Parliament.) Some people remark that I must have been crazy to drive alone all over as I did. I never once felt threatened and in any way fearful that anything would happen to me. Perhaps I was just lucky that nothing did. This second safari was to last 15 days. It started with a flight from Cape Town to Kimberley, where I picked up with my Karibu Safari guide and driver. Here I had a second chance to take a look at the "big hole." There was a larger group on this safari and we had another super large vehicle as well. During this 15 days, we drove to the Augrabies Falls, Ai-Ais, the Fish River Canyon, Luderitz, Kolmanskop, the Namib Desert (at Sesriem), Naukulft, Swakopmund, the Skeleton Coast, Brandberg (rock paintings), Etosha National Park (Okaukuejo and Namutoni), the Gross Barmen, Windhoek. All the time we lived in the tents and slept in sleeping bags. At one point I thought I was going to be eaten alive by flies. I was able to swim in a large pool on near the top of a mountain where a spring fed the pool before the water fell down and into a small river. I walked to and up the spine of a 350 meter high sand dune, what an experience. I walked in an area where we were permitted to walk, where there are billions of dollars of yet to be claimed diamonds. I spent just two more days in Capetown on my return. I again had an Avis Volkswagen Golf for two days this time. I had left my excess luggage at a friend's home, and picked it up. I had been given a contact name of a member of the (then) White Parliament by the embassy in Washington, and looked him up. He had been notified by the Embassy and was awaiting my call. He was most gracious in giving me a spectacular tour of all the houses of Parliament in Capetown; The White, the Colored, and the Indian. He took me to lunch in the Parliament dining room. We dined with the Minister of Finance and another high ranking official. This was one of the most fantastic meals that I had ever had. It was 6 courses long and with each course we had a different wine. We had a very pleasant discussion about the political way things were going in South Africa. After lunch my host took me to the guest viewing balcony where we could hear a speech by the then President of South Africa. My host and his wife even drove me to the train station where I was to catch the world famous Blue Train going from Capetown to Johannesburg. I paid a very high price for the single suite (B Coupe) on the Blue Train. But I think it was worth the extremely great grandeur way of life in super first class train travel. There was just three cabins in my car. One was a two room suite that took up about one half the length of the car. It had a full bath with tub and shower over it, toilet and wash basin. The second suite was about two thirds of the other onehalf. It was only one room but very large. It also had a full bath. Mine took up the rest of the car. The room was about twice that of a normal train room. It also had a full bath. I even told my friends that I would find the first woman I met on the train to come into my room and take a photo of me in the tub, just to prove that there was one. Would you believe it was the first woman's lady friend who did it? The two photos are in this section.